As I was driving up a beautiful Haitian mountainside to a village recently infected with Cholera, my mind began to think about the contrast of beauty and tragedy. I knew I would experience a beautiful land and people, but I also knew we were headed into the path of a deadly disease. In 2011, there was a Cholera epidemic in Haiti that killed thousands of people, and in 2017, Cholera was once again rearing its ugly head. I spent a little time prepping for this trip by learning that Cholera is primarily transmitted by ingesting water that is contaminated with the Cholera bacteria. The treatment for Cholera is actually quite simple and includes rehydration and in some cases, small doses of antibiotics. Rehydration sounds simple, but if you have no clean water the disease quickly escalates. In my next blog post, we’ll learn just how quickly this can happen. We arrived in the village to a large crowd of people. I’m working with an NGO called Water with Blessings. 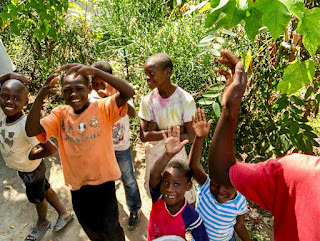 They do work here in Haiti and in Honduras and have done small projects in 42 other countries. 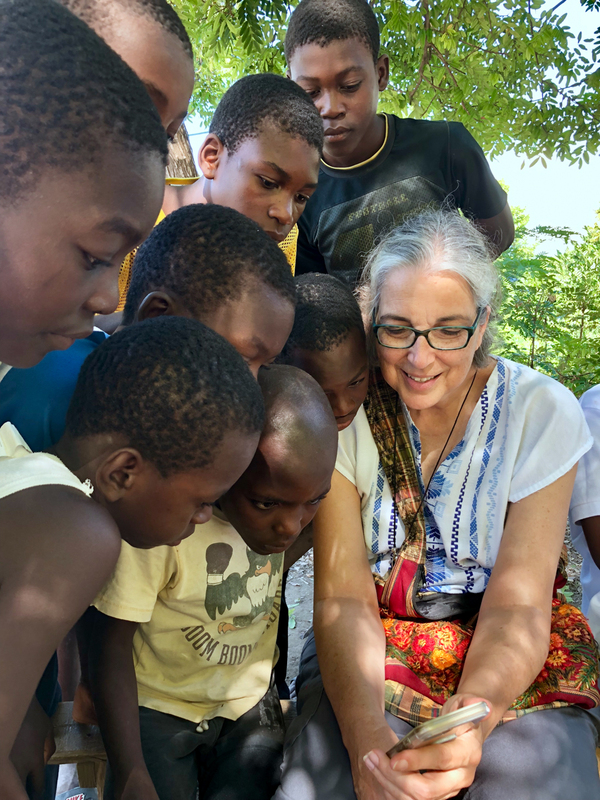 Sister Larraine Lauter runs this ecumenical water outreach and her secret weapon is her Water Women program. Water Women become the water champions of the villages in which they live. They’re randomly chosen at a ratio of 1 Water Woman to every 4 households. The Water With Blessings team is very proficient at using their lean staff to train trainers all throughout the countries in which they work. The trainers then train the Water Women. Trainers are mostly women, but there are some men as well. 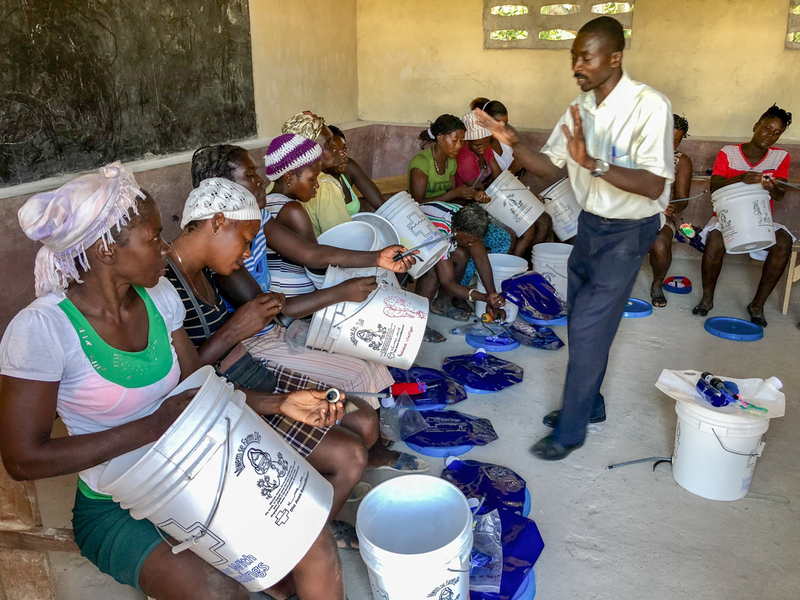 The training lasts about 3 hours and is very thorough and teaches the Water Women how to use their Sawyer filters, as well as their responsibility to share their water with 3 additional households. There is tremendous community participation in Haiti where these Water Women will focus on the bold task of eliminating Cholera in the whole country! There was a large gathering of children in the village who were full of smiles and were eager to have their photos taken, although there were a few camera-shy ones at the beginning. I am always drawn to the smiles and laughter of the children. Even though we don’t speak the same language, smiles and laughter bring universal joy and the children always win my heart. 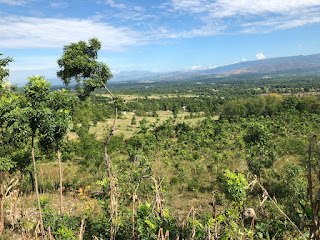 As I listened to different women sharing stories of Cholera in their villages, there was a reality that everyone in these villages had been affected by Cholera in some way. Many had lost loved ones and children which brought about a fear of the river which was the source of their drinking water. On this particular day, hope for a Cholera-Free life was brought to the 60 Water Women who came to the training. From those 60 Women, 240 households would now have access to clean water. I can only imagine how many lives will be saved! There are a lot of diseases in the world that we have not yet found a cure for. 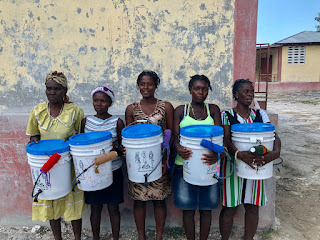 There are some diseases like Cholera that can be easily prevented using cost effective Sawyer water filters. Today, my heart is full of gladness that these 60 Water Women will provide clean water for 240 households. My heart also breaks with the thought that children and adults in Haiti and around the world will die of water borne sickness that could be so easily prevented. I believe a radical dose of generosity can solve this crisis and transform the world in our lifetimes.